How to lose weight while you sleep and feel energized the next day is a question that you should ask if you want to have an ideal weight. Weigh loss and sleep are mentioned in The American Journal Of Clinical Nutrition, they found that when people lack sleep they snack carbohydrates at night and it makes them gain weight. When we do not sleep well we tend to make bad decisions, there is not clarity in the thoughts and be tend to be impulsive, this is because lack of sleep makes the frontal lobe of the brain slower. 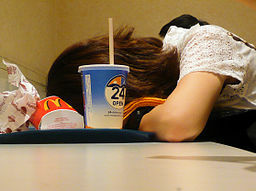 When we are overtired we tend to look for comfort foods and eat bigger portions. There are hormones that influence hunger and fullness. Among them for example the hormone Leptin, produced by your fat cells, says to your brain “ I am full and satisfied” and the hormone Ghrelin, produced by the cell in the stomach, says to your brain : “it is time to eat”. When you are sleep deprived the hormone Leptin decreases and you feel hungry. Sleep deprivation affect other hormones like cortisol and insulin and this affect the metabolism of sugar and fats tend to accumulate and you feel tired. Growth hormone is going to be affected by lack of sleep too, your body produces less when you do not sleep enough and this causes loss of muscle and slow metabolism. Sleep helps you to recover from exercises, it helps heal the muscles, and when your body rests while sleeping everything is restore. If you want to lose weight, apart for a nutritious diet and exercise you need a good night sleep. Turn off your computer at least one hour before you go to bed. Go to bed the same time everyday. The last two hours before going to bed think relaxing thoughts. Do not drink coffee after 4 pm. Drink chamomile tea one hour before sleep. Eat some cheese, drink warm milk or a piece of turkey one hour before sleep.